There seems to be a new trend on the motherboard market – various motherboard makers have started offering motherboards designed specifically for overclocking, possibly creating a new market segment. The latest company to offer an overclock-oriented motherboard is ASRock with its all-new Z77 OC Formula mobo. The Z77 OC Formula features the new CEB form factor – which makes it a bit taller. 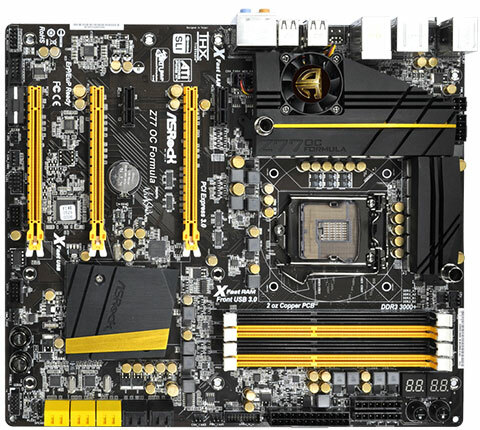 The new motherboard also uses high-quality gold-plated polymer Japanese capacitors and as the name suggests is based on the Intel Z77 chipset, which offers support for all Socket LGA1155 based processors. Other overclock-friendly features include Digi-Power 12+4 phase power design, high-density power connectors and gold contact points for the CPU and the memory. There’s also twin-power cooling, which is in fact both air and liquid cooling for the CPU VRM. The CPU also gets clean power thanks to one 8-pin and one 4-pin EPS connectors. In the BIOS you will also find pre-defined overclocking profiles. Specs-wise the Z77 OC Formula offers support for up to 32 GB of DDR3-3000+ memory as well as two PCI-E 3.0 x16 slots, one PCI-E 2.0 x16 slot (x4 electrically), two PCI-E 2.0 x1 slots, 3-Way NVIDIA SLI and CrossFire X, on-board sound (ALC 898), on-board networking (Broadcom BCM57781 gigabit LAN), 6 SATA III 6 Gb/s ports (two via Intel Z77 and four via Marvell SE9172), four SATA II 3 Gb/s ports. There’s USB 3.0 support too, 8 fan connectors, voltage measurement points, three USB 2.0 headers, HDMI, optical SPDIF and clear CMOS button. ASRock also bundles new overclocking software with the Z77 OC Formula – called “Formula Drive” the new piece of software will help you overclock your CPU easier. The Z77 OC Formula will become commercially available later this month for a “moderate” price.